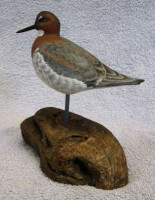 The Red-necked Phalarope was Walt’s first completed attempt at a Decorative Shorebird Decoy. The basic design is quite similar to the design supplied by Glenn McMurdo in his 2015 seminar held at the Carvers Oasis. The head was altered and the size adjusted in some areas to meet Walt’s interpretation of the Bird. 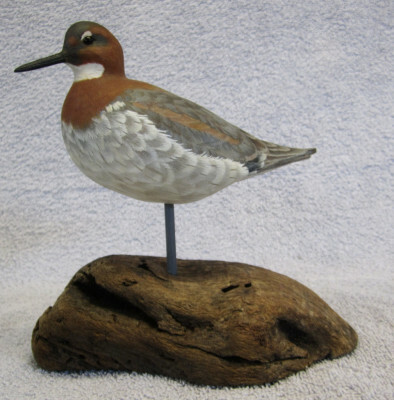 As with all Decorative Shorebird Decoys the sculpture has no surface texturing or feet. All the feather detailing is done with paint. This project entailed a significant amount of airbrush detail as well as hand brush detail. Walt paid significant attention to develop the shading which reflects the perceived light direction on the completed sculpture. 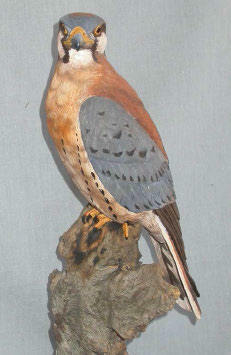 The bird was made from Tupelo wood and was painted with artist acrylic paints from various paint manufacturers. The mount base was a piece of driftwood cut and modified to look like a seashore rock structure. 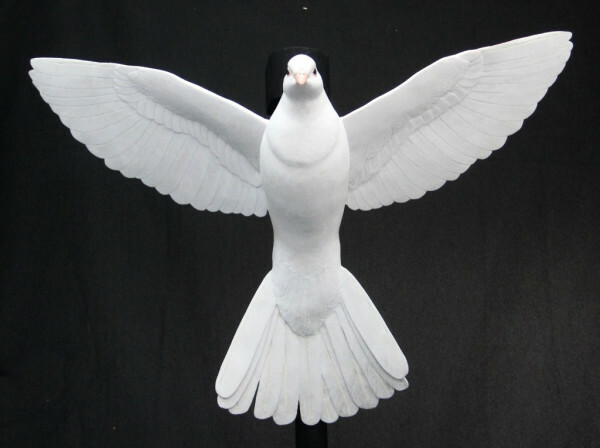 This oversize White Dove was commissioned for display in a 7th Day Adventist Church. Once again Walt’s extensive research and painting skills resulted in this lovely commission piece. The wingspan is 24 inches wing tip to wing tip. The original concept was to mount the tail against a Sun rising background or a Celtic-Cross, however, it was ultimately decided to hang the sculpture directly on the wall. 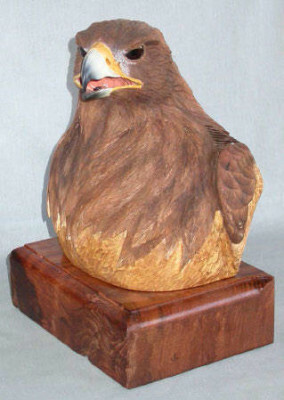 The bird was made of Tupelo wood and carved with acrylic paints. 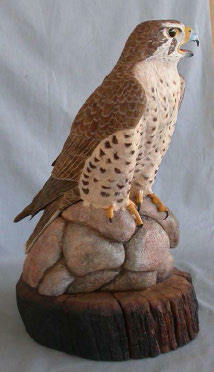 All the primary feathers are carved and the remaining feathers were brought out with paint. The real challenge for this project was the white on white coloration and shading. This commisioned sculpture is in a private collection. 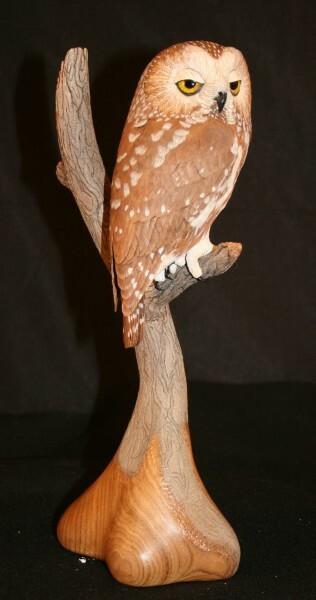 Walt was requested to teach a Saw Whet Owl seminar by the local carving clubs. 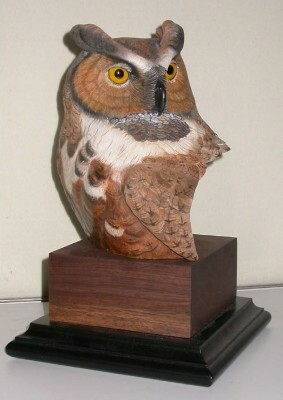 The owl was carved from Basswood so that the local participants did not have to use power carving techniques and tools. Walt intentionally designed the bird to be similar to his first carving attempt, “Quiescence”, so he could compare his skills progress. The project maintained Walt’s concept for the sleepy eyes. 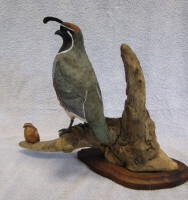 In this version Walt mounted the bird on a Butternut base which transitions into a carved Pine Tree branch. This sculpture is in a private collection. After extensive research, Walt completed this lovely commission piece. 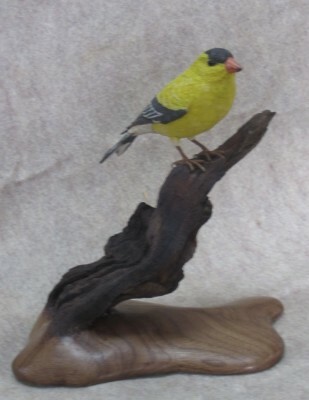 The bird was made of Tupelo wood and carved with acrylic paints. The wax protrusions at the end of the secondary feathers are made from a two-part epoxy. 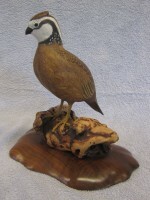 The soft texturing was achieved with an epoxy texturing-stick and then wood burned over the same area. The soft color transitions were achieved using a wet on wet painting technique. The Mountain Ash branch and leaves were manufactured from brass tubing, wires and thin brass sheet stock. The branch assembly was silver soldered together and five minute two-part epoxy was used to affix the leaf and berry stems to the branches. 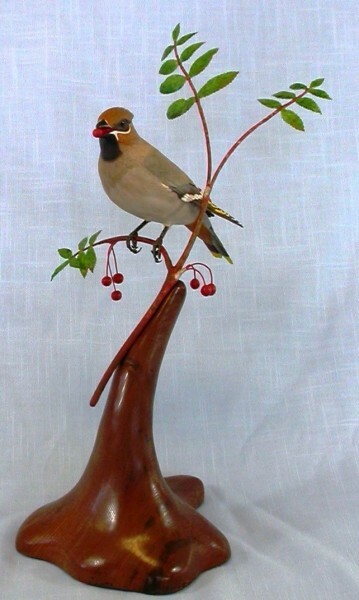 The berries were made from epoxy and brass wires were used for the berry stems. Walt was quite pleased with the completed mount as this was his first attempt at a brass mount. The commissioned piece is in a private collection. Once again Floyd supplied the pattern and Tupelo cut out and basic Maple base. 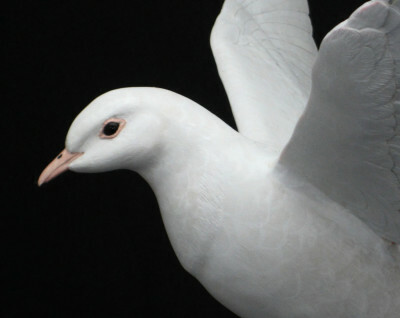 For this sculpture the wings were carved separately and inserted into the body of the bird. The Axillary feather group under the wing were also inserted. The eyes are high-quality glass Taxidermy eyes. The eye rings and feet are epoxy. Some airbrush work was used for the tail bars, however, the majority of the white spots and feather detail required hand brush work. The entire sculpture was painted with Liquitex acrylic paints. 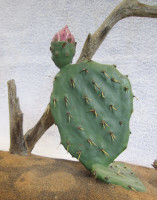 The Prickly Pear mount utilized the lessons learned from Walt’s original “Renewal” sculpture. Tupelo wood was used and the thorns were made from bamboo kitchen skewers. 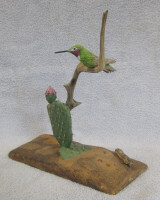 The cactus is swelled out and beginning to blossom, reflecting a recent rain in this bird’s native desert environment. Floyd supplied the pattern and Tupelo cut out and basic Maple base. The eyes are high-quality glass Taxidermy eyes. The eye rings and feet are epoxy. Walt took the basic bird design and added his own detail features such as the lifted feathers on the stretched neck, and adding ripples in the tail and wing feathers; significant features which were not taught in the seminar. The rock pillar was designed and created by Walt using Tupelo wood. Walt sculpted the supplied rectangular base to add the rock overhang and to blend the rock crevasses into the overall sculpture. The entire sculpture was painted with Liquitex acrylic paints. 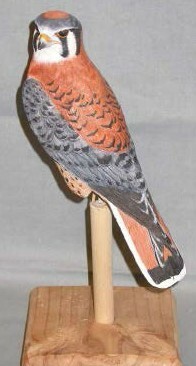 Airbrush techniques were utilized to develop the color contrast on the feathers. 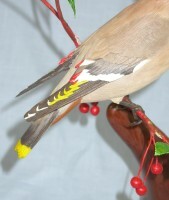 Detailed hand brush work was used to further enhance the detail on the feathers and feather edges. Walt designed this beginner project when he was teaching for local parks and recreation departments. 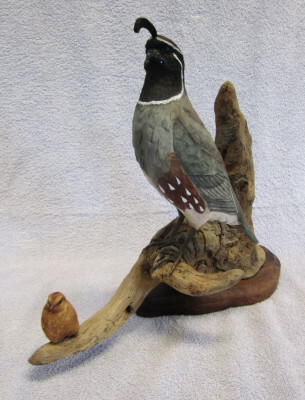 The bird is Basswood and was designed so that local carvers and beginners could complete the project without power carving and using only a knife and few gouges. 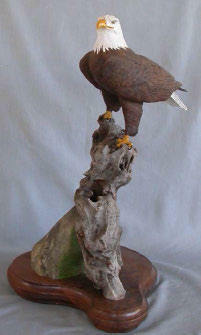 The mount is a piece of driftwood and the base is sculpted Butternut. This was Walt’s first attempt at painting a “smoothie” bird; a bird where the feathers are defined with paint only. For this project Duane supplied the basic pattern and fundamental painting colors and Duane developed the hand-painting techniques for this project. 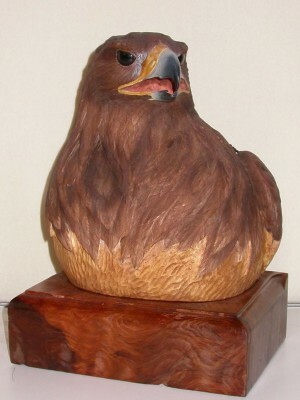 The bird was made from Basswood. The glass eyes and pewter feet were affixed to the bird with plumbers epoxy. Liquitex acrylic paints were utilized to paint this project. 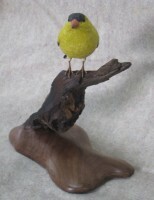 The driftwood mount was affixed to a sculpted Butternut base. Floyd supplied the pattern and Tupelo cut-out and Walnut base. The eye rings and beak are epoxy. 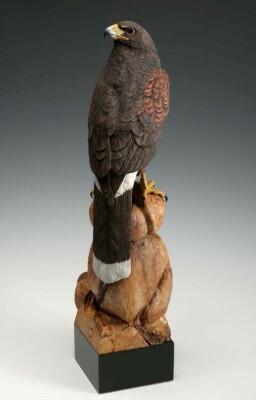 The inserted “ear” tufts were individually-carved feathers. Walt took particular effort to highlight the eye rings. Undercutting the fluffy feathers along each side of the beak was a particular challenge as was the feather group under the beak tip. The bird was painted with Liquitex acrylic paints. The color contrast on the feathers was airbrushed. 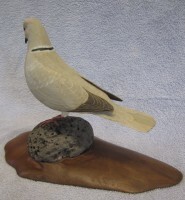 The entire breast feather groups were carved, however, the feather pattern and texturing was done with painting techniques. The base is Walnut, which is finished with several coats of sanding sealer and a polyurethane topcoat. Floyd supplied the pattern and Tupelo cut-out and Redwood base. The eye rings and tongue are epoxy. The open mouth has an inserted epoxy tongue. The feather flow and bare bust contouring are Walt’s original design. The bird was painted with Liquitex acrylic paints. The color contrast on the feathers was airbrushed. The Redwood Burl base was finished with several coats of sanding sealer and a polyurethane topcoat. This sculpture was inspired by the increase in frequency of the Eurasian Collard Doves which were visiting Walt’s back yard feeders. After doing research at the University of Arizona’s Ornithology Lab in Tucson, Arizona Walt discovered that this invasive species was originally from India. 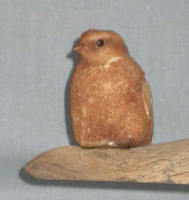 It was taken to England as a pet and then to the Bahamas where several birds were released and migrated to Florida. From there they have migrated throughout the Southern United States. 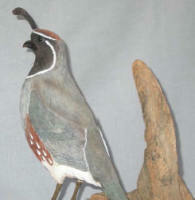 The bird was carved from Basswood. The soft texturing was achieved with light wood-burning. 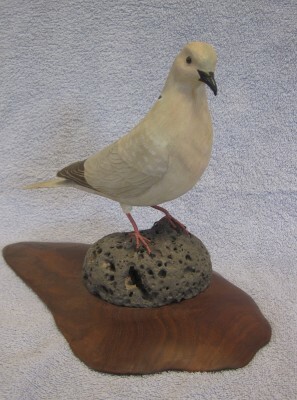 The sculpture uses commercial pewter feet and high-quality taxidermy eyes. The bird was hand painted with acrylic paints. The volcanic rock mount was affixed to a sculptured Butternut base. The sculpture was donated to a charity auction and is in a private collection. 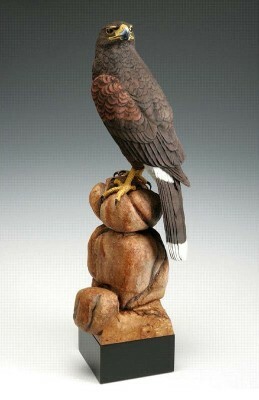 We were fortunate enough to have a live falconry bird for this seminar named "Renegade", thus the name for this sculpture. 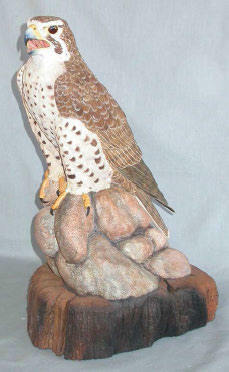 This sculpture started with a supplied pattern and Tupelo cut-out. The eye rings, toes, talons, and tongue are epoxy. 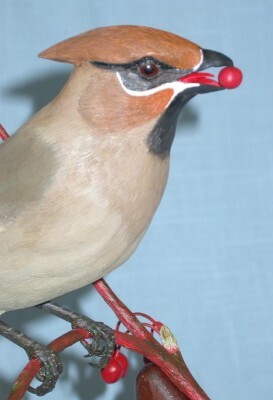 The open mouth has an inserted epoxy tongue. The base is burnt Redwood, which is finished with several coats of sanding sealer. The raised feather detail and feather painting are Walt’s original concept. The feather tipping technique, using Liquitex acrylic paints, was one of Walt's experimantal efforts. 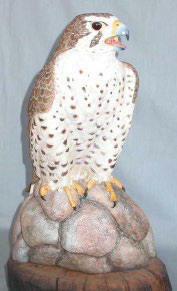 The color contrast on the main body of the feathers was airbrushed. Walt's original design rocks are also carved Tupelo. This was the first professional seminar held in Walt’s “Carvers Oasis” studio in 2004. Floyd inspired the name for the studio. Floyd supplied the pattern and Tupelo cut out. The eye rings, toes, and talons are epoxy. The bird is painted with Liquitex acrylic paints. The color contrast on the feathers was airbrushed. 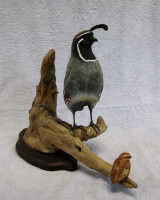 The basswood rocks and California Myrtle driftwood mount are Walt’s original design. The base is black walnut, which is finished with several coats of sanding sealer. This seminar was taken to solidify many of the techniques Floyd was teaching. Walt concentrated on advancing his skills in carving, texturing, and painting. 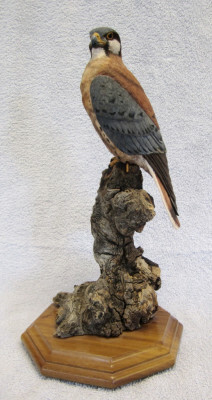 After the show Brenda conducted a seminar, at the Carvers Oasis, on painting a Kestrel. The painting techniques were quite different from those used by Floyd. In this seminar Walt improved his wet-blending technique and learned how to “pull” the feather edges. 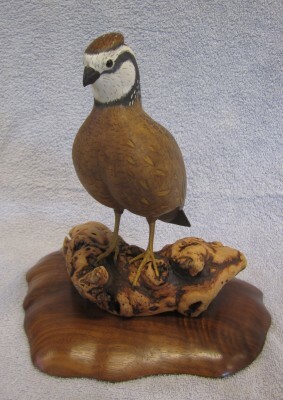 he original seminar goal was to carve a Gambel Quail, however, we added a chick. The presentation Walt developed has the father on guard over the young chick. 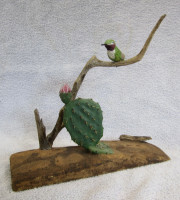 The driftwood mount is a piece of California Myrtle. The base is Black Walnut, which is cut in a shaped to simulate the shadow of the carving. 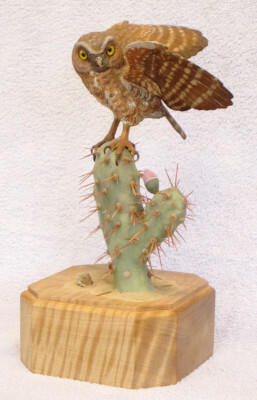 The presentation was inspired by the desert renewal after a forest fire. The Prickly Pear Cactus is renewing itself from a fallen pad just in time to flower for the migrating Broadbill Hummingbird. The cactus thorns were made from bamboo shish-kabob skewers, which were broken up and splintered with a hammer and bleached in wood bleach. 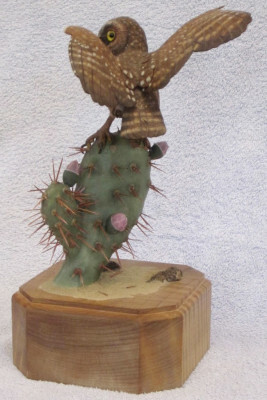 The desert floor consists of a variety of colored sands glued onto a basswood base. 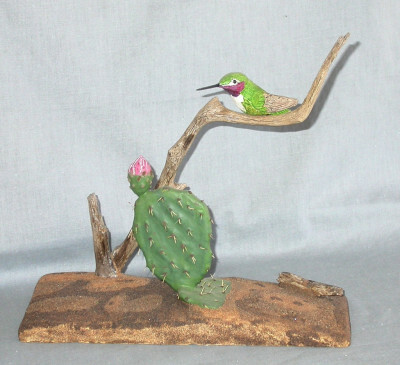 The hummingbird mount was made from a piece of driftwood, which was broken into pieces and reassembled into the stump and branch.